Imagine if you could pick up a digital file or a note on a computer and pass it to a colleague's computer as easily as you can give them a paper document or a Post-It note. Researchers at Sony's Computer Science Laboratories in Tokyo believe they have figured out how to do just that. Today, laptops, mobile phones and PDAs are everywhere and we digitally swap or access an increasing amount of information. But is still difficult for two people who are in the same room to copy files or notes between their devices. The typical ways of exchanging files, using e-mail, discs, or a shared file server, are impractical or clumsy in many cases. Dr Jun Rekimoto and his team at the Sony Interaction Laboratory (http://www.csl.sony.co.jp/IL/) have been grappling with these challenges, and recently presented their research to an international audience in Vienna, at the CHI2004, a conference on how we interact with computers. Dr Rekimoto's lab has extended the drag and drop technique used in most PC software to create a 'pick and drop' technique. So the owner of a handheld computer can pick up a file from their device, using a special pen, and drop it onto the screen of another computer, by placing the pen on its screen. He refers to this approach as 'direct manipulation'. It allows people to visually select and move information in physical space, rather than having to understand abstract concepts of networks and servers. The pick and drop technique would make it easy for two colleagues in a meeting to exchange files between their laptop computers, new acquaintances to pass each other electronic business cards, or friends to swap references to websites or music tracks they like. Another technique that the labs has developed is referred to as 'pick and beam'. This uses displays projected onto tables and walls, using data projectors, that act as extended working spaces. Documents can be dragged using a special pen from a computer desktop into these spaces. There they can be spread out or exchanged, allowing people to work with them almost as if they were paper documents. "These technologies are very interesting for truly intuitive interaction," said Ian McClelland, a senior design consultant at Philips Digital Systems Laboratory in the Netherlands. He added that much of the work was as important as "the development of the mouse". The mouse, developed in the 1960s by Doug Engelbart and colleagues at the Stanford Research Institute in California, was intended to empower an earlier generation of computer users. It allowed them to directly manipulate information within the two-dimensional space of the computer screen. 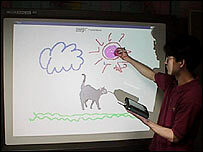 Dr Rekimoto showed that the pick and drop gestures could also be used with digital whiteboards, where the pen might be used to select and apply a colour from a palette, or identify and place images from a picture library. The 'pick and drop' system was developed using the Mitsubishi Amity handheld pen computer and a Wacom PL300 pen-sensitive desktop screen. Pens are given a unique ID, which is readable by the computer when the pen is close to its screen. When a person taps on an icon with the pen, the computer contacts a 'pen manager' server, via a fixed or wireless connection, and the object is attached to the pen, although the pen itself has no storage capacity. When the pen tip comes close to the screen of another device, a shadow of the attached object appears on its screen. Tapping the pen tip instructs the 'pen manager' server to copy the file to that location. Most CHI2004 attendees were impressed by the demonstration, but Dr Russell Beale, of the School of Computer Science at the University of Birmingham in the UK, said it was "toys for the boys". He said that the lab lacked a rigorous approach to evaluation or theoretical development.